Yesterday while looking through Pinterest for ideas for the backyard, we came across a pin for using ice cream cones for seed starters. You can see the pin here-Use stale ice cream cones for seeds. The thing that stood out was the plants in the ice cream cones. It was clover and moss. We have a yard full of clover and moss! So ma decided to make her own weed ice cream cone. I could see ma's brain starting to work because her eyes started twitching. Off to the kitchen she went. When she finished her project, I sorta got excited. 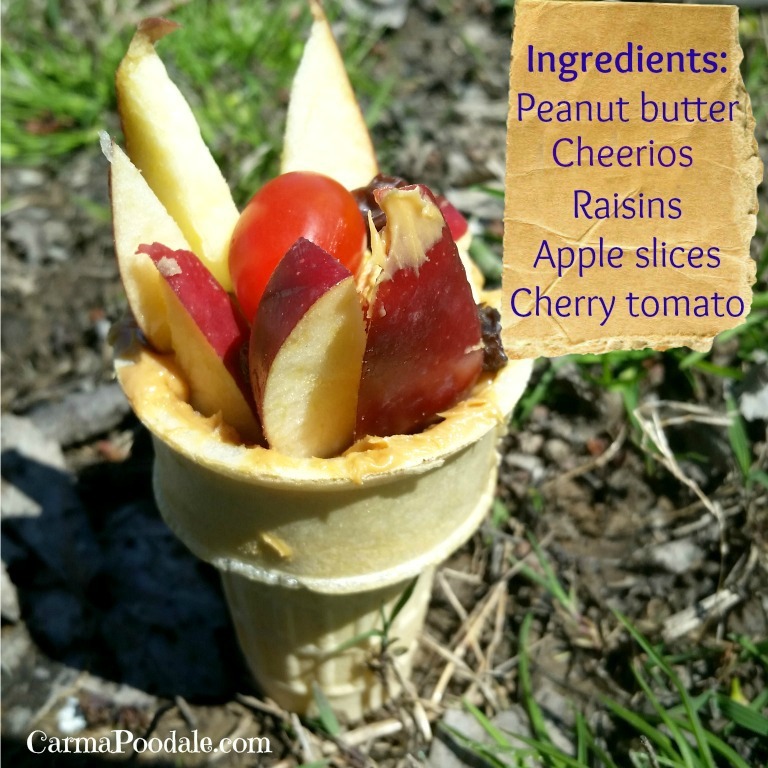 She filled the cone lightly with peanut butter to help hold the ingredients. She assembled the cones with layers of goodies. The peanut butter held the cheerios in place. It also helped the apple slices to stand up. She placed the ice cream cone in the tree hole but it sat there for a hour. We didn't have any squirrels at that time. She brought the ice cream cone in until we spotted a squirrel. After dinner we were sitting on the back stoop and we seen one of the squirrels that visits every day. He was there to rob the bird feeder. Ma ran in the house and got the ice cream cone. She put it out for the squirrel and waited with her camera. She went in the kitchen to get a RC and when she came back the ice cream cone was missing. That squirrel grabbed the cone and took off with it!! She went back to the kitchen and made another squirrel cone. We looked out the backdoor and out in the front yard. There were no squirrels! WHERE ARE THEY?? We had to wait another hour for a squirrel. This time we had one in the backyard. Ma armed with her camera and RC, I armed with anticipation grabbed the second cone and while I ran that squirrel up the tree, she put the cone down. We waited.... waited.... waited... and FINALLY that squirrel came down to get to the bird feeder. 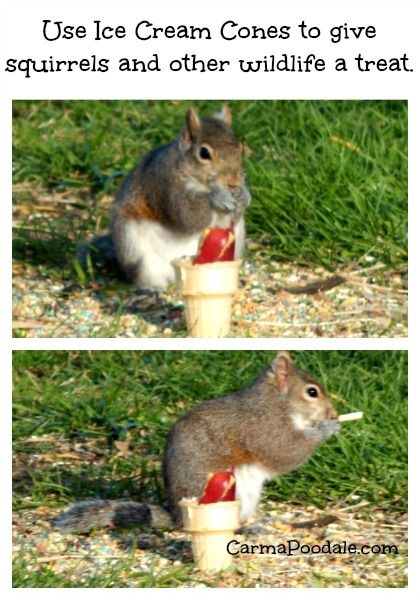 The squirrel spotted the ice cream cone and started sniffing it. The next thing we knew, the squirrel was sitting there eating the goodies in the cone! The whole time the squirrel was eating the goodies in the cone, the birds were able to eat their seed in the feeders. Once the squirrel got done, she grabbed the cone and took off with it. Happy Squirrels + Happy birds = happy ma. You can use different types of fruits or cereals. The rodent block foods are good for squirrels too. Sometimes you may be able to find it on clearance or on sale. Many squirrels love to eat apples, peas, watermelon, grapes, berries, broccoli and yellow squash just to name a few. Squirrels do not need a lot of fruits because it can stop some of their calcium absorption. The different foods that can be put in the cone can be endless. 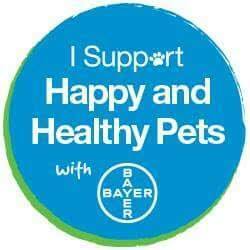 Always keep fresh water out for them. 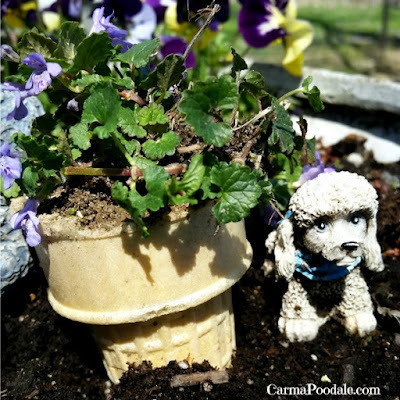 Instead of planting weeds or seeds in a ice cream cone and taking a risk of the squirrels grabbing your cones. Make the squirrels their own cone treats. It stops them from raiding your bird feeder as often. The tree rats ate your stuff! All you need is a calliope music box to get them running toward the squirrel cone feeder.